CORONA, California – May 10, 2017 – Steve Saleen, CEO of Saleen Automotive, Inc., delivered a Special Edition Saleen Mustang Police Car to the Riverside Police Of cers’ Association in Riverside, California, which represents the Riverside Police Department’s frontline. Officers, Detectives, and Sergeants. This specially built Saleen Mustang will be used to bring awareness and attention to their fallen of officers and promotion and avocation of the Police Officers’ Assistance Fund, which provides financial assistance to officers’ families in Riverside and surrounding communities. It will also be a tool in recruiting new of officers, engaging the community, and generating a cohesive camaraderie with Riverside Residents. 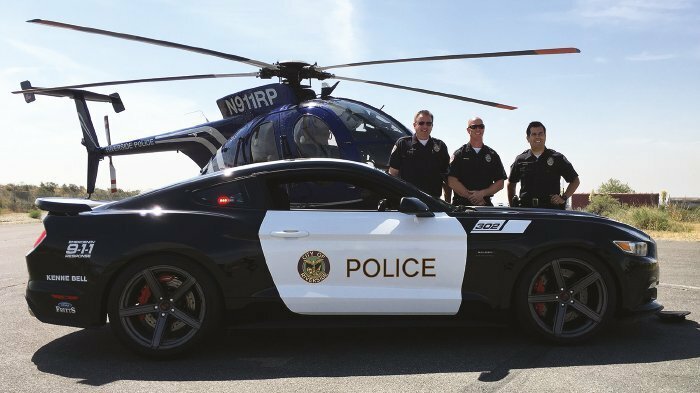 Detective Aurelio Melendrez, who also serves as vice president of the Riverside Police Officers’ Association, said, “We are excited and pleased to receive delivery of this Special Edition Saleen Mustang. It brought incredible smiles to those in the department who were on hand to take delivery. We are honored and thrilled that Saleen Automotive has shown their support of the Riverside Police Officers’ Association/Riverside Police Department in this way.” Melendrez stated that the majority of police of officer’s deaths across the country are attributed to automobile accidents; after driving the Saleen Mustang he felt the vehicle was the best accelerating, handling, and stopping (police) vehicle he has ever driven. The technology that led to this vehicle’s extreme performance is something he hoped to see become used in a more widespread format, to improve of er safety and vehicle response. The Riverside PD employs roughly 350 men and women. Drivers of this particular Saleen Mustang have been specially trained to handle the speed, cornering, and overall handling. As with any tools assigned to department employees, only those quali ed will handle the car. To date, Steve Saleen has trained a handful of department employees. Melendrez feels Saleen’s continued work building police vehicles and training of officers with this exceptional technology would keep of officers safe. He is hopeful to continue a collaborative effort between Saleen and Riverside PD.